Texas style barbecue has been taking the nation by storm over the last few years with professional pit masters and backyard chefs alike experimenting with perfecting the beef brisket, ribs, and pulled pork that so many of us love. One tool of trade has quickly risen to the top of the "must-have" list of these BBQ aficionados across the country: pink butcher paper. What exactly is pink butcher paper (sometimes called peach paper)? Why has it become so incredibly popular in the BBQ industry? How can pink butcher paper help pit masters in cooking, resting, and serving their mouth-watering creations? These questions and more are thoroughly covered in our exclusive collection of interviews with four barbecue experts from different areas and different backgrounds, but who all agree that pink butcher paper is key to their success. 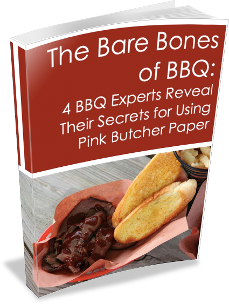 The Bare Bones of BBQ: 4 BBQ Experts Reveal Their Secrets for Using Pink Butcher Paper.